Enter your email address here and you will receive a notification when I add a new post. 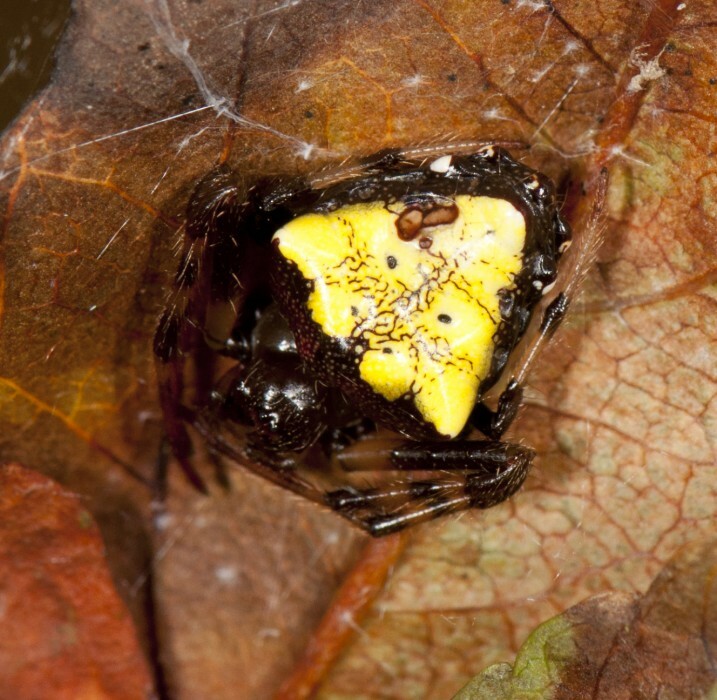 Some of our most common spiders are extremely variable in color. 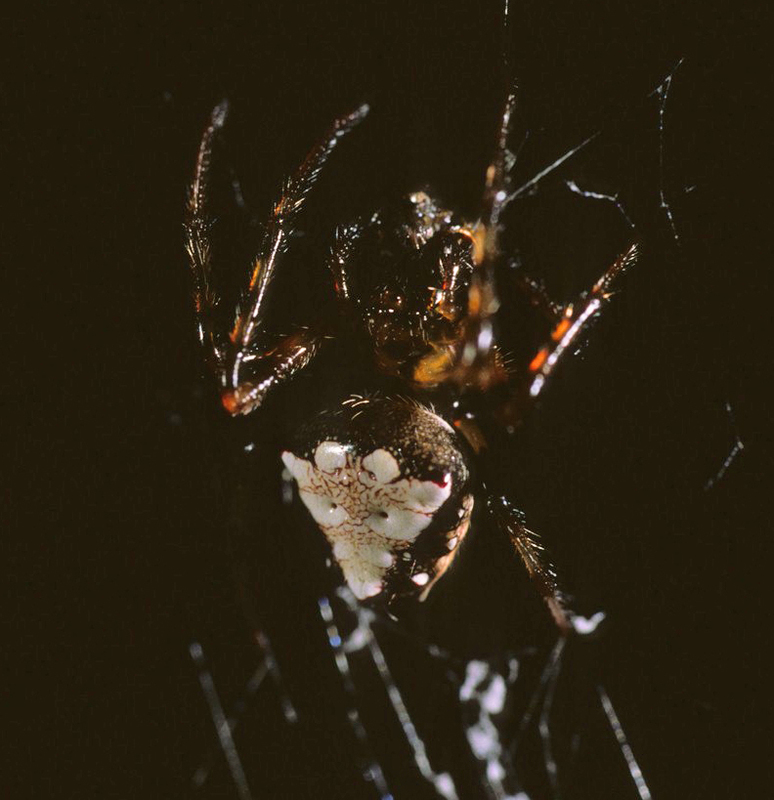 A few spiders can actually change color to match the background. 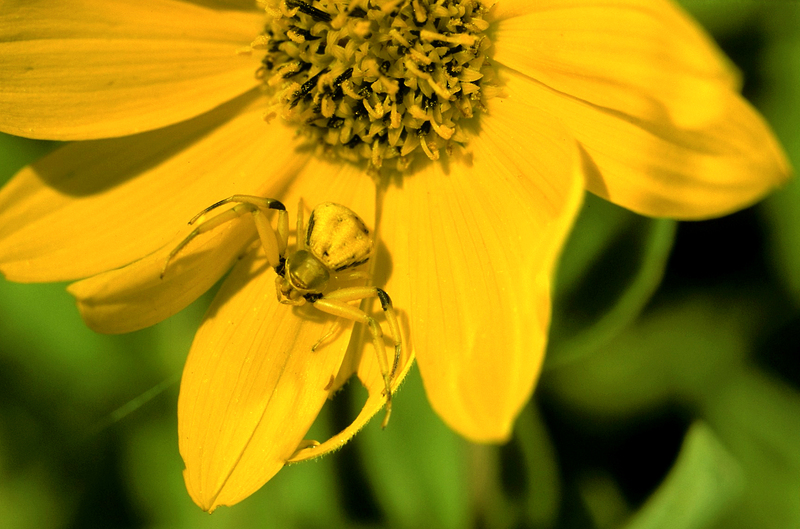 The “flower spider” group of crab spiders are the most famous of these here in Ohio. They get this name from their behavior of waiting in flowers, where they ambush visiting pollinators. For example, the whitebanded crab spiders (Misumenoides formosipes) in flowers sometimes match the color of their ambush site. In a study of the influence of color on movement between flowers, and success at capturing prey, Alissa Anderson and Gary Dodson demonstrated that crab spiders which matched their background did capture more prey. 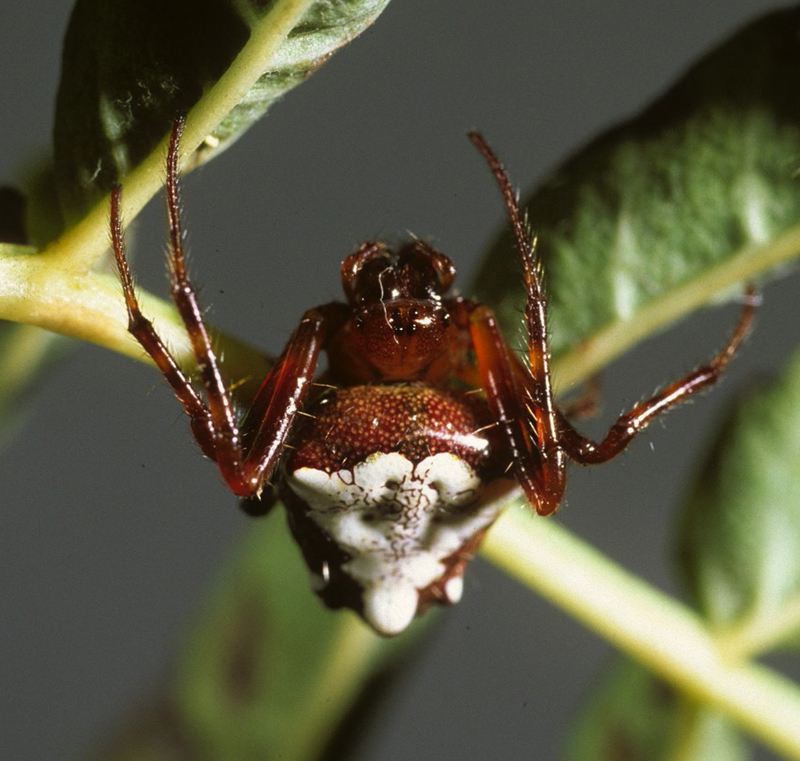 By the way, just in case you were wondering, the white band in the name “whitebanded crab spider” refers to the light-colored ridge (carina) that runs across the face below the eyes. 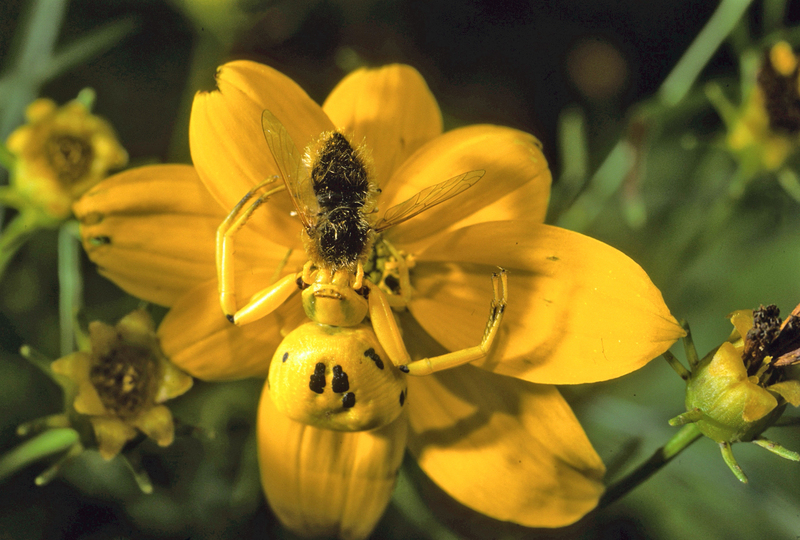 The carina is the best way to tell this spider from our other common color-shifter, the goldenrod crab spider (Misumena vatia). 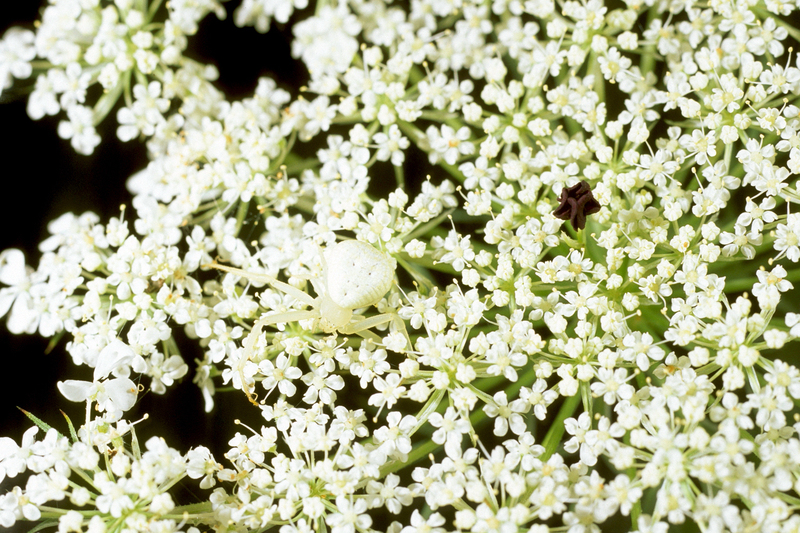 The goldenrod crab spider shown below has adopted white coloration to blend in (quite well) well with the queen Anne’s lace in this view. Other spiders have discrete “color forms” where there is discontinuous variation in color from one form to another. 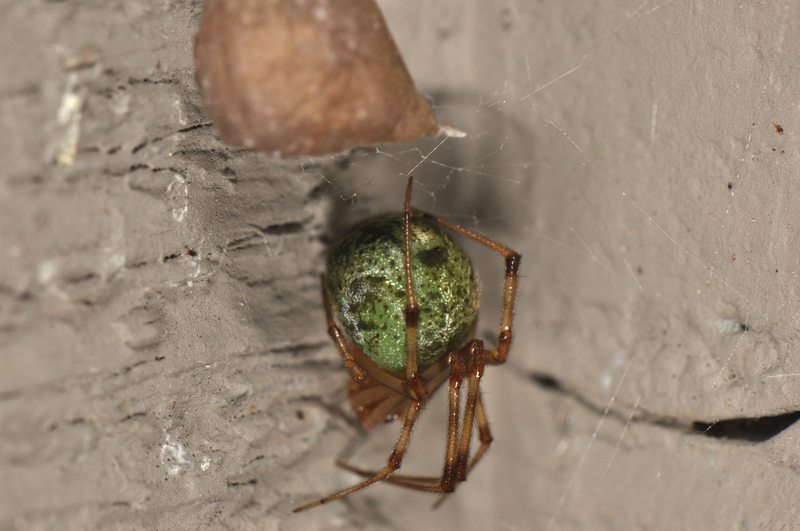 One example of this type of color variation is the triangulate orbweaver (Verrucosa arenata). In this species the cephalothorax, legs, and most of the abdomen are either red, or black. On the abdomen there is a bright triangle-shaped mark that is either white or yellow. 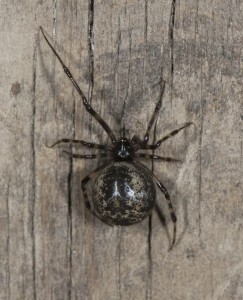 Individuals of this spider come in many combinations of these colors. Other spiders seem to have more continuous variation in color. 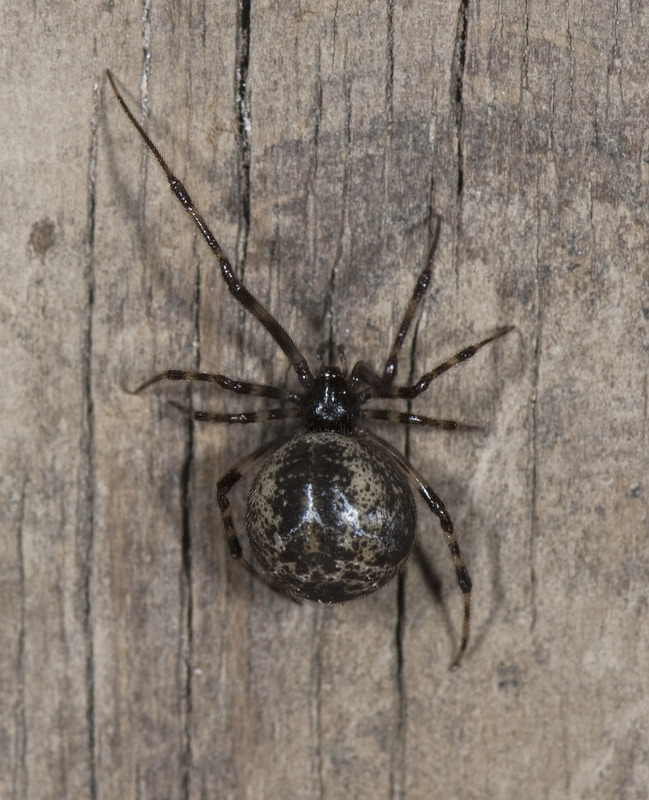 One candidate for the most common spider in the world is the aptly named “common house spider” (Parasteatoda tepidariorum). 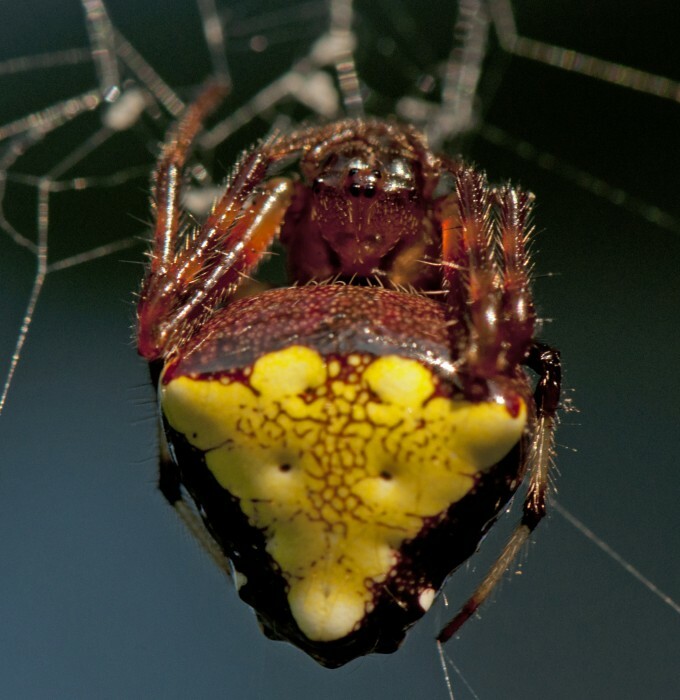 This cosmopolitan spider can be found around buildings nearly everywhere. It was just as common outside my office at the University of Sydney in Australia during the 1980’s as it is around the Ohio State University. 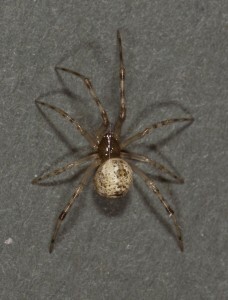 Here in Ohio, the cephalothorax and legs are usually a deep brown, sometimes reddish brown. The abdomen has a variegated pattern with a base-color that may be pale tan or yellow, or very dark, nearly black. Some individuals have a more red-orange tinge to their dark markings. 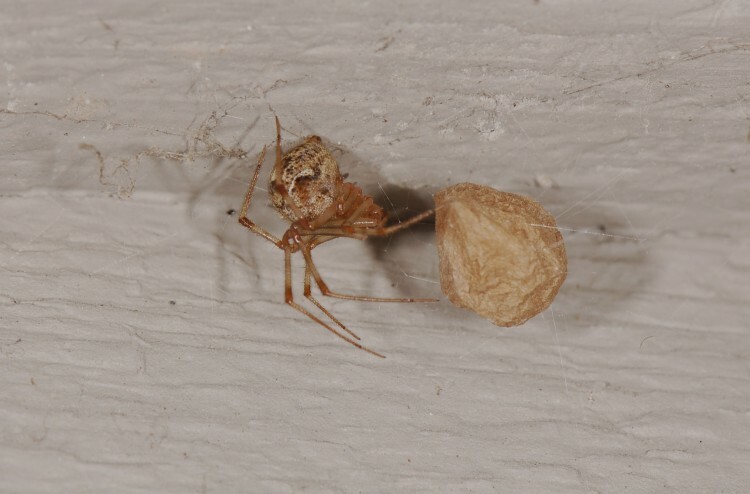 The brown teardrop-shaped egg cases of these spiders are often found in the webs of adult females. 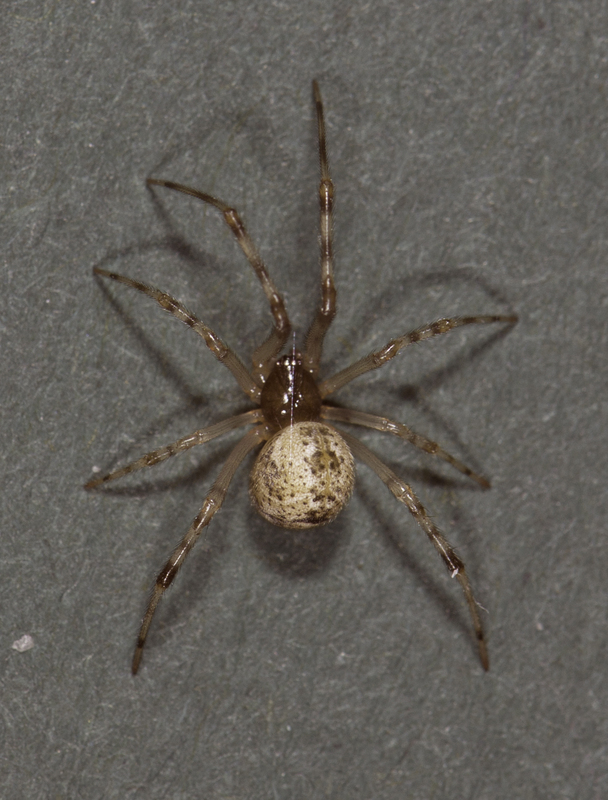 We have many of these spiders on the walls of our house in central Ohio. They capture a wide variety of prey. On July 27th 2014 I photographed this female who had just captured a harvestman (aka daddy-long-legs). Note that she has only one egg case in this photo (one with a distinct pointed end). Evidently it was a good meal, because by the next day she had two egg cases, having constructed a second one overnight. Amy noticed that she had captured one of the bright green stink bugs that are common in our yard. 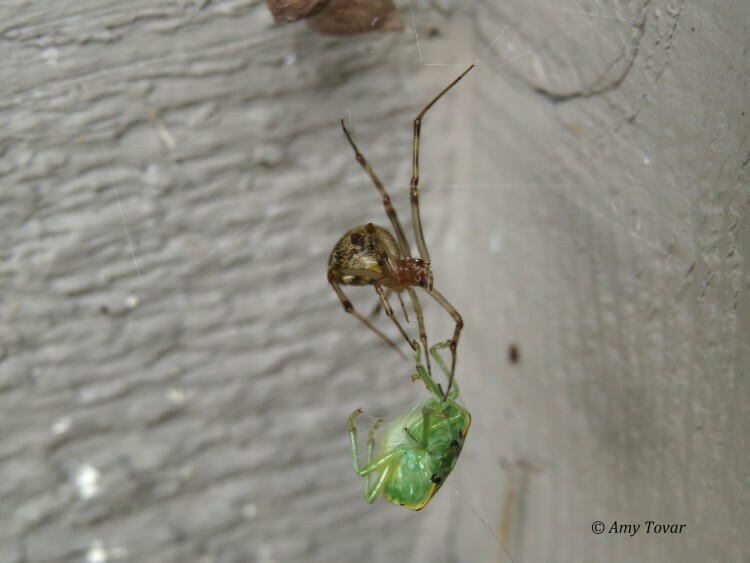 Here are two of Amy’s photos of her with this prey item. 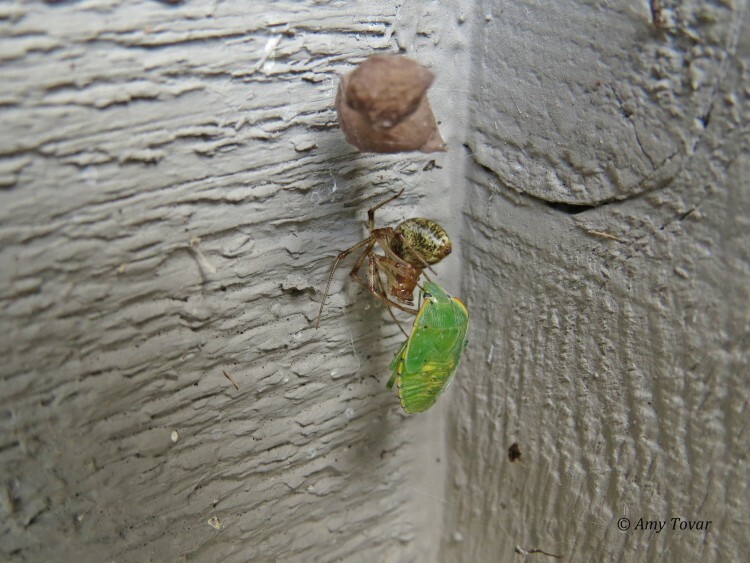 After eating this green bug, she made a remarkable color change. She had evidently absorbed enough of the green pigment from her prey to tint her abdomen green. These photos were taken the very next day. This diet-related color change has been noticed by many spider workers. Back in 1989 Rosemary Gillespie also demonstrated that diet had a profound effect on the color of the famous “Happy Face” spider of Hawaii. She published a study of this phenomenon in the Journal of Arachnology. You can read this paper here. In 1998 Theodore Evans and Patrick Gleeson published a paper on a method of exploiting this by feeding dyed termites to captive spiders. The termites were fed paper stained with non-toxic stains. The color was transferred to the spiders when they ate the termites. 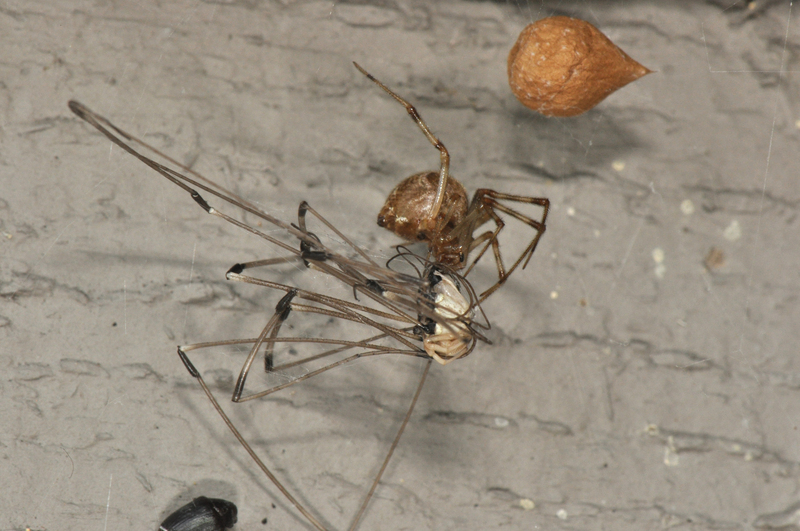 They used this technique to “mark” the long-bodied cellar spiders (Pholcus phalangioides) with distinctive colors. 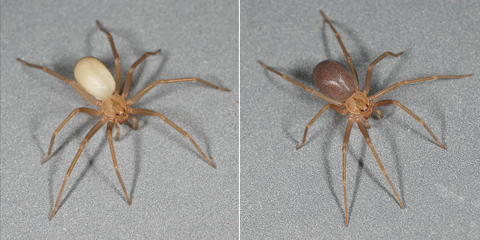 Rick Vetter has pointed out in his recent book The Brown Recluse Spider that the abdominal coloration of brown recluse (Loxosceles reclusa) can change dramatically after meals of heavily pigmented prey. In the pictures below, the left photo is what the spider looked like after eating crickets. 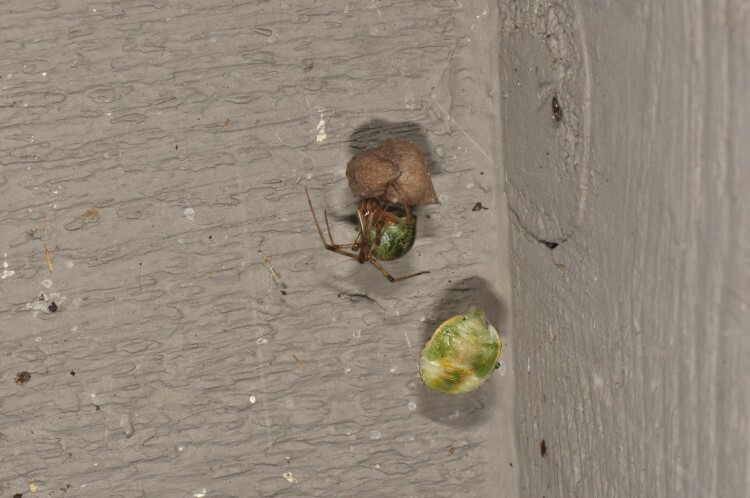 The photo on the right shows how the same spider appeared after eating two house flies. Reprinted from The Brown Recluse Spider, by Richard S. Vetter. Copyright © 2015 by Cornell University. Used by permission of the author, Richard S. Vetter. All rights reserved. Rick’s book describes the biology of the brown recluse and its relatives. He carefully separates myth from reality, and provides useful information about this most notorious American spider. It can be purchased here. 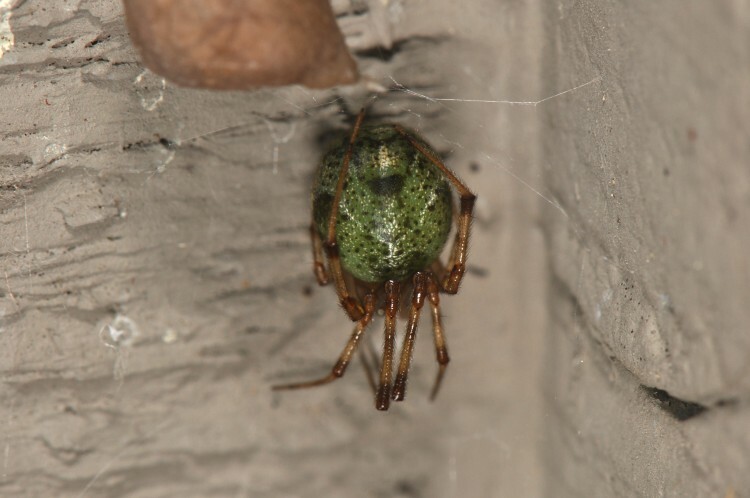 These examples of diet-influenced color change are most obvious in spiders with pale or generally lightly-pigmented abdomens. Often the cephalothorax and legs remain the same because they have a thicker, opaque exoskeleton. So the moral of this little story is that sometimes “you are what you eat”, or at least you might look like it. Anderson, A.G. and G.N. Dodson. 2015. 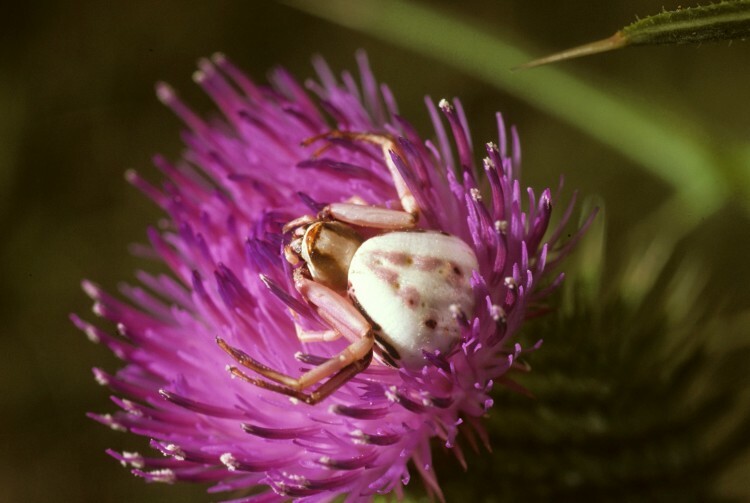 Colour change ability and its effect on prey capture success in female Misumenoides formosipes crab spiders. Ecological Entomology, 40(2): 106-113. Evans, T.A. and P.V. Gleeson. 1998. A new method of marking spiders. The Journal of Arachnology, 26: 382-384. Gillespie, R. G. 1989. Diet-induced color change in the Hawaiian happy-face spider Theridion grallator (Araneae, Theridiidae). J. Arachno!., 17:171-177. Vetter, R. 2015. The Brown Recluse Spider. Cornell Univ. Press, Ithaca. 186p. Nice post, Rich! I’ll add that sclerotized parts tend to continually darken with age as the tanning process continues, so older individuals are often darker than younger ones. This can change the appearance of epigyna drastically. One more challenge to identifying spiders! My daughter was in the tub & picked up a spider. It@ abdomen was translucent. I got it out of he tub & put it in the toilet. It’s abdomen went from water color to brown as i watched. It was like a quick flick & it was brown to match it’s upper body. It was a skinny spider. What might it be? A very interesting story, but I have no clue what species might have been involved.